Irish born Thomas Francis Meagher, (pronounced “Mah-ur”), (1823-1867), orator, convict, solider and one time Governor of Montana, is at last gaining the recognition in his home country that his amazing life deserves. Heretofore less well known in Ireland as he is in the United States of America, tales and biographies of his life are emerging to great acclaim, not the least of which is the exciting and memorable 1848 Tri-Colour Celebrations, now a Spring regular in the calendar of Meagher’s home city of Waterford. Up until relatively recently, the knowledge of this Irishman’s fame was limited to historical societies and those with an interest in military history – these facts, we’re glad to say, are now changing with Meagher being recognized for his many remarkable achievements around the world, and in particular in the United States. Born in Waterford, Ireland in 1823 to a wealthy merchant father (in the building currently occupied by the Granville Hotel on Waterford’s mile-long quayside), Meagher was schooled in Clongowes, County Kildare and later in England, quickly gaining a reputation as an orator and writer of some repute. As his passion for Irish nationalism grew, he joined the Young Irelander movement, which at the time, and in opposition to the likes of Daniel O’Connell, advocated armed insurrection against the British crown. His rousing orations aroudn this time prompted Edmund Makepeace Thackery to christen him “Meagher of the Sword” ! Having formed a new body, the Irish Confederation, in 1848, at the height of the Irish Famine, Meagher travelled to France hoping to learn from revolutionary events there, and returned with a gift (reputedly from a Parisian seamstress) of an Irish tri-colour, which was flown for the first time in his home city at the Wolf Tone Confederate Club at 33 The Mall, Waterford on March 7th 1848. Having taken part in the rebellion of 1848, Meagher was sentenced to death and due to be hung, drawn and quartered, but had his sentence commuted to penal servitude, and banishment from Ireland to the penal colony of Tasmania, Australia. It was from here that Thomas Francis Meagher was to rise again and the next chapter of his remarkable life began. Having married in Tasmania, his firstborn infant son sadly died there in 1852, by which time Meagher had escaped from Van Diemen’s Land to the United States, His wife, Katherine Bennett later joined him there but she became ill (and pregnant) and returned to Ireland where Meagher’s only surviving child was born – a son (TF Meagher III) in late 1864. Meagher would never meet him. 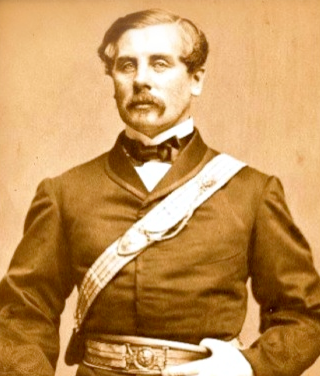 Thomas Francis Meagher remarried in 1855 and began a life in the United States. At the outbreak of the American Civil War in 1861, Meagher founded the 69th New York regiment – and would later create ‘the Irish Brigade’, a group of Irish regiments – and fought on the side of the Union. His unit became famous for its bravery at the battles of Fredericksburg and Antietam, where it suffered major losses. In later life, Meagher was was acting Governor of Montana, and was soon raising forces to fight hostile Indians, when he died in tragic circumstance, still a young man of 44 years. The incident, in July of 1867, records Meagher as falling into the Missouri River from aboard a paddle steamer, never to be seen again. Download a most noteworthy account of Meagher’s life, and the tribute made to him in Helena, Montana from this article, which originally appeared in “The Intermountain Catholic” newspaper in July of 1905.